If you wish to stay updated, feel free to subscribe here: Subscribe to HiRa's newsletter. Since 2012, HiRa is giving ATIH Ascension workshops all over the world as a certified teacher of the School of Remembering, founded by Drunvalo Melchizedek, Sedona, USA. 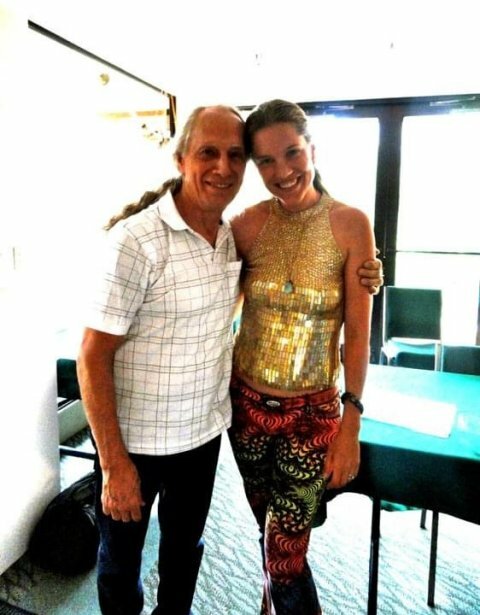 HiRa was formed by Drunvalo in the first Sedona teachers training in 2011, all the while following up her training until his last Cosmic Grace workshop in Sedona in 2015. The Awakening the Illuminated Heart workshops are created for you to Awaken your Heart. When we remember how to live from the Sacred Spaces of our Heart, our Life responds with Joy & power and we can activate our living light-body: the Merkaba. These workshops can further assist us in the opening of our third Eye, through practicing ancient techniques which were hidden to our world for a very long time, which we now call the Tantra of the Heart (without partner). We'll also be tapping directly into the Creation Process through the Sacred Spaces of our Heart. Dive deep in this life changing 4 day intensive workshop presented by Buddhist Zen nun Hira Hosen. This workshop was awesome and shifting time for me and Hira the instructor was beyond expectations and very professional and powerful. I certainly would love to repeat it again just to connect with such energy. Thank you ???????? ???? I came to the workshop wanting to heal my pain and to create from my heart. I can say that is what I got from this workshop and more. The feelings I felt in this workshop were quite amazing empowering, loving, blissful. Hira creates an amazing healing environment for healing, empowering and love to shine through. Hira also created a friendly, playful atmosphere that didn’t get to flooded by too much information this really helped to enter the heart and made it fun. I am very appreciative I got to experience this workshop in the shadow of a pyramid in a wonderful organically built resort. To be surrounded by such powerful healing love from everyone that attended in a safe environment is hard to describe in words. The energy and blockages that were removed was very energy taxing but wonderful as well. Some past pain came up and was cleared and I cannot picture a better environment to heal these wounds. Each day felt more amazing then the last. To think I almost didn’t come to this workshop is very amusing to me now. It was one of the best decisions of my life that I know it will have a lasting change on my life. I formed a connection with higher self learned lasting meditation techniques that connect to my heart. The energy from Egypt is quite powerful. I have made connections with wonderful people I feel as if they are my tribe. I know now I must return to Egypt because of the connection I have to this place is quite powerful. (Also I will come back for the food soooo good) If it resonates with you go to this workshop you won’t regret it. I have attended a workshop previously and left completely uplifted spiritually and emotionally. Unfortunately this wasn't my experience on this occasion. Had this been my first experience, it may well have been my last. Fortunately my previous experience is more than enough to encourage me to continue on my journey to be in my heart. Hira Hosèn teachings are very clear en direct. She connects with you on a high level of conciousness and that feld very comforting. Dear Hira, thank you so much for your trust and loving guidance back to the source. Lots of love, Monique vV. Great workshop. Very powerful experience! Lovely people and a lovely speaker! Hira is an amazing teacher with a great knowledge and experience. Love her! Hira is an excellent teacher of this workshop. What impressed me most was that she is 'real', she is totally honest, natural and herself, and is not afraid to show all her sides, the strong and the vulnerable, and that she is also on the way, and not a 'saint' already :) also, her answers and guidance for me was spot on and very empowering. And the atmosphere she cocreated was open, funny, and flowing very femininely. Thank you very much Hira!